'Get it on' was written by Marc Bolan and recorded by his band T-Rex in 1971. The Power Station recorded a cover version of the track in 1985. It was released as the second single from their debut album. The track was a hit in the UK, where it reached number 22, and America, where it peaked at number 9. When Robert Palmer heard that the other Power Station members had recorded demos for the song, he asked to try out vocals for it. Before long, the band had decided to record the entire album with Palmer. After Duran Duran's third album 'Seven and the ragged tiger', the members of the band split into two bands. One was Arcadia, which maintained the melodic and atmospheric aspects of the Duran Duran's previous recordings. The other was the Power Station, in which John and Andy Taylor worked with Robert Palmer, Tony Thompson, and Bernrd Edwards to create a rhythmic harder rock sound. Roger Taylor was mainly the drummer for Arcadia, but also contributed percussion to the Power Station. 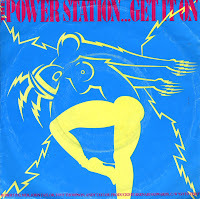 The Power Station's debut single was 'Some like it hot', an aggressive-sounding single with soulful vocals by Robert Palmer. The single peaked at number 6 in the US Billboard Hot 100 chart, number 13 in the Dutch Top 40 and number 14 in the UK singles chart.